The search for historical facts can be time consuming and tedious, however, it is usually a rewarding process. Researching the OMFPOA and its 50 years of continued commitment to the preservation of life and property through code enforcement and public education has been exciting to document. This book will provide you with information on how this association has been striving to make Ontario one of the most fire safe jurisdictions in North America. It is with great pride that the executive of the Ontario Municipal Fire Prevention Officers’ Association Incorporated dedicates this book to those who had the vision to join together to promote fire and life safety collectively across the province of Ontario. The association began in 1956 in Southwestern Ontario. The Fire Prevention Officers of Ontario are grateful to the gentlemen who, through their need to provide a fire safe community, founded this organization. St. Catharines, Thorold, Welland, NOTL, Niagara Falls, Fort Erie, Port Colborne, Wainfleet, Lincoln, Grimsby, West Lincoln and Pelham. It began with fire prevention officers from St. Catharines, Welland and Niagara Falls holding educational sessions in the 1970s reviewing the Ontario Building Code and continued into the 1980s reviewing the Ontario Fire Code to gain an understanding of these regulations. Over time representation from all twelve Niagara Regional fire departments formed the OMFPOA Niagara Chapter with an Executive consisting of a President, Secretary and Treasurer. Meetings were held monthly every third Thursday in the evenings rotating at each regional fire departments. $1.00 from each member covered coffee. Around 2001, monthly meetings changed to every third Thursday in the mornings. In late 90s annual chapter dues from each fire department of $50.00 were approved by Regional Chiefs and present day the amount is $100.00. Niagara Region was the first to form a chapter under the Provincial OMFPOA and recognized as Chapter No. 1. Niagara Region has a constitution. Niagara Region was first to host the OMFPOA provincial seminar involving 12 fire departments in 1999. They did it again in 2015 and 2016! Fort Erie and twice in Niagara Falls, have hosted the OMFPOA provincial seminar. Several members from the Niagara Chapter have held Provincial Executive positions from Presidents, Vice President, and Directors to Newsletter Editor. The OMFPOA Provincial Jim Copeland Award was created in 2001 honouring Jim Copeland from St.Catharines Fire Services. Jim passed away in June 2000 from cancer that was approved by WSIB as a work related injury. Jim held the position of President of both the OMFPOA Provincial and Niagara Chapter. Jim also received the Fire Marshal’s Public Fire Safety Award posthumous for his contributions in fire prevention. Two members from Niagara Chapter are recipients of the OMFPOA Provincial Jim Copeland Award. Three members from Niagara Chapter are OMFPOA Provincial Life Members. Present day - twelve fire departments continue to work as one! The South Eastern Chapter has been in existence since the late 80's or early 90's - we have been blessed with many dedicated previous members and executive members as well as our current existing members and executive. We have had great support and attendance from our OFM Reps and guest OFM Reps - esp. when clarity has been needed on current OFM policies - Fire Code Changes. The relationship among members has been extremely gratifying over the years to date - we reach out and network with each other for information and advice - our meetings are held quarterly - usually the first Wed. of every three months and we have always tried to have informative and relevant speakers to assist- inform and train our Fire Prevention Officers to keep them up to speed with the ever changing aspects of Code Enforcement - Public Fire Safety Educations and Fire Investigation. Del Blakney - our current President extraordinaire is currently making great strides in expanding our Chapter members to truly be a hub for all of the South east chapter fire departments. The partnerships, the networking - the dedication of our members and executive truly helps us all in trying to be the very best Fire Prevention Officers we can be. We have had TSSA - ESA - Kitchen Suppression experts and OFM speakers just to name a few in the last couple of years. Our next meeting in June for example will be in Smith Falls Ontario -we try to move the meeting locations around to allow for ease of travel for most of our Fire Prevention Officers and that helps with our attendance in that regard. In Smith Falls for example we will be having a tour of the Tweed Marijuana Factory which I am sure will be enlightening as is Marijuana Commercial outlets are becoming very popular right now - our last meeting in Prince Edward County allowed for a tour of one their local wineries and again was another example of assisting our members with all the different aspects of what has to be inspected and be in compliance within the different aspects of the Ontario Fire Code. We will continue to strive to train - educate - assist our members be the very best Fire Prevention Officers they can be. Ajax, Brock Township, Clarington, Oshawa, Pickering, Scugog, Uxbridge and Whitby. There is documented evidence that fire prevention efforts in the Region were independently performed as far back as the early 1850’s. Over the years, members from both full-time and volunteer fire services would meet periodically to discuss common issues and concerns although a more coordinated alliance was not established until after WWII. The Durham Regional Fire Prevention Officers Association was officially recognized as Chapter “IV” of the Ontario Municipal Fire Prevention Officers Association on August 2, 2001. As a sub-committee of the Durham Regional Chiefs Association, the DRFPOA was formed to provide; a more uniform and efficient fire prevention service; fire safety education and fire protection in the Region of Durham. A main historical milestone was the creation of the Regional Municipality of Durham in 1974 that defined municipal boundaries, and spurred the formal creation of Fire Prevention Bureau’s within the larger municipalities. General Motors who attended the meetings to discuss fire safety interests and issues. As municipalities grew in the Region, fire prevention personnel were employed in all municipalities to primarily focus on code enforcement and public education programs within their communities. 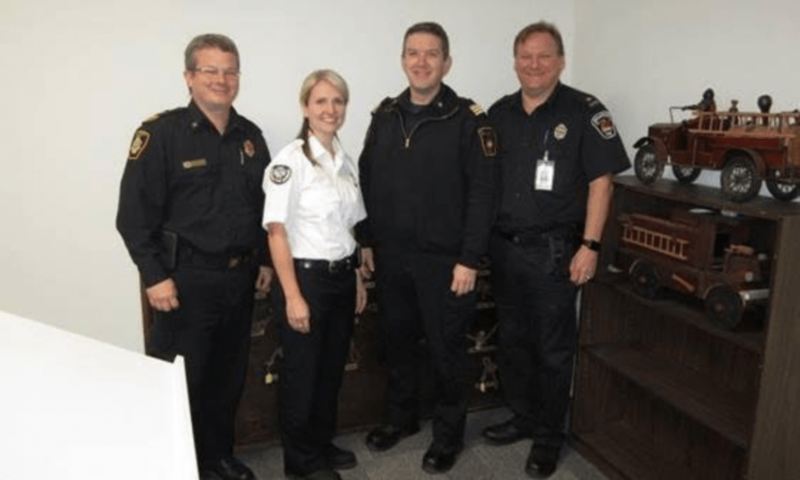 With the increased attention to fire prevention, the DRFPOA created an alliance with associate members that included the local advisor from the Fire Marshal’s office, and the surrounding municipalities of Cobourg, Peterborough, Kawartha Lakes and Port Hope. The current DRFPOA is now comprised of over 40 dedicated fire prevention personnel that participate on a number of coalitions that include; the public educators, the school board, and hoarding sub-committees. The Association continues to meet bi-monthly to discuss topics relevant to all aspects of fire safety in the community. They are involved in training and educating their members and members of the community on issues such as; high-rise fire safety, vulnerable occupancies, and building and fire code related requirements. Partnerships have been developed and maintained with local school boards, the police service, CAMH, and local businesses to distribute fire safety messages in the interest of the protection of lives and property from fire. The knowledge, experience and functional relationship of the DRFPOA members are the foundation of past initiatives and successes, and will continue to guide them in future accomplishments. The DRFPOA were the hosts of the 2012 and 2013 OMFPOA Symposiums. Recently developed and implemented the smoke and carbon monoxide alarm awareness program known as Get-Real-Durham. Chapter Six was formed with the OMFPOA Provincial Executive in 2001 and the main goal was to provide training on fire prevention topics. The Chapter Executive consists of the President, Vice President and the Secretary and does not collect any dues so there is no need for a Treasurer. The Chapter has adopted the OMFPOA Provincial Constitution. A milestone for the Chapter was the GTAA joining in 2005. The Chapter meets every three months with each department taking a turn with hosting the meeting. The meetings are held from 9:30 am till approximate 1:00 pm. The goals for the meetings are to share best practices, have a round table discussion and arrange for a guest speaker. Past speakers have presented on public education initiatives, code enforcement and fire investigations. As the Chapter covers a geographic area with three municipalities we are unable to establish best practices, or policies for the Chapter too follow when completing their duties. The Chapter Executive is responsible for planning meetings, setting the agenda and arranging along with the host department guest speakers or information sessions. Minutes for each meeting is maintained and posted on the OMFPOA Provincial website under Chapter Six. The Chapter Executive is also trying to post any PowerPoint presentation on the website as well. June 22, 1983 - A meeting was held with the Simcoe County Chiefs and FPO’s to discuss forming a county FPO association. Oct. 6, 1983 - It was moved that we become a chapter of the OMFPOA and have our own constitution. There will be membership fees of $1 per department, per year and a fee to attend meetings of 50 cents per department, per meeting. 1990 - We held our first annual golf tournament. In 2005 the Chief Fire Prevention Officer from Windsor Lee Tome, joined the Ontario Municipal Fire Prevention Officers Association at an executive level. As a result of joining the Ontario Municipal Fire Prevention Officers Association on an executive level, the CFPO quickly discovered the benefits of having a local chapter. The Essex County, Chatham-Kent Region Fire Prevention Officers Association had their first official meeting as Chapter 8 of the Ontario Municipal Fire Prevention Officers Association in May, 2005 with the municipalities of Windsor, Essex, Kingsville, Amherstburg and Tecumseh. That chapter has grown over the years and now encompasses the municipalities of LaSalle, Leamington, Lakeshore, and Chatham-Kent. There are currently 23 members in the Association. In 2014 a group representing the fire departments in the Grand River area approached OMFPOA executive member Scott Hardwick regarding the possibility of creating an OMFPOA chapter in their area. With the assistance of Scott and the rest of the OMFPOA executive, the Grand River Chapter was formed. The chapter’s inaugural meeting was held in November 2014, and an executive was elected. OMFPOA President Gary Laframboise welcomed the new chapter and presented the newly elected executive a cheque for $1000 to assist with start-up costs. The Grand River chapter meets on a regular basis, offering training and networking to its members. We are all very grateful for the support of the Grand River Chapter fire departments and honoured to join a meaningful organization such as the OMFPOA and become part of its rich history.